Perfect for any two people who want to move around comfortably, easily and safely. It’s the lowest step-through you can get. And that means comfort even before you start riding. This means stable, low-resistance 20″ wheels, a shock-absorbing hinge, and a rigid steel frame produced in-house by us with 10 years’ guarantee. In order to have the LowStep Tandem fold up ultra-small, we’ve constructed an extra-solid folding hinge. This makes the LowStep so compact that you can even put it in the boot of a VW Golf without folding down the rear seatback. Well-known specialist publications frequently accord us the highest praise for our two-seaters. 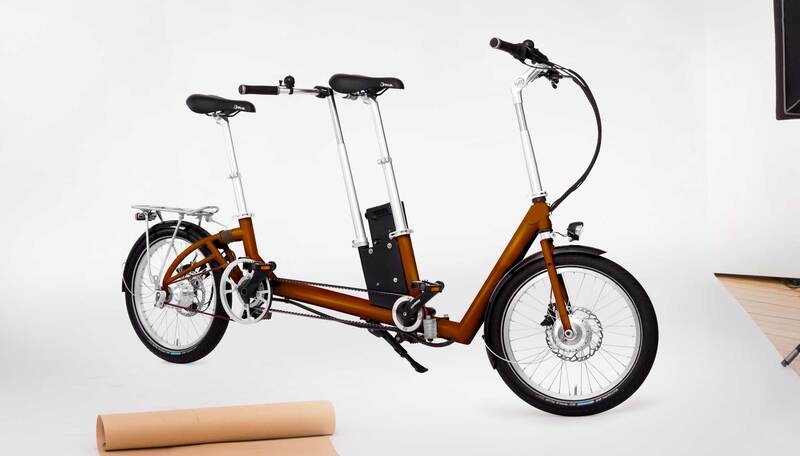 For transport by car, our LowStep Tandem can be folded up in just 30 seconds. And it will fit inside standard mid-sized cars with no problem. So you don’t need a tough-to-mount roof rack or rear rack. On trains or on local public transportation systems, it will fit into nearly all bike racks and compartments even in ready-to-ride form. So getting on and off public transportation is stress-free. Our tandems can take a maximum load of 260 kg. Even if you might not need that right now, it’s always nice to have this reserve in the back of your mind—after all, who knows who you might end up taking along on a tour? Our LowStep Tandem is available in total weights starting at 20kg.